Ignacio Haya cigar box with numerous items. 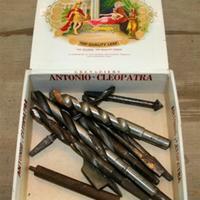 Antonio y Cleopatra cigar box with 11 various types of drill bits. 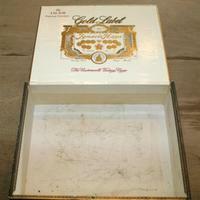 Empty Ignacio Haya Gold Label cigar box. Antonio y Cleopatra cigar box with various items. 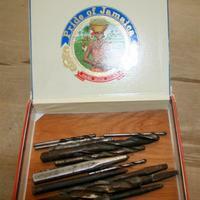 Pride of Jamaica cigar box with 10 drill bits, 3 punches and 1 other unknown tool bit. 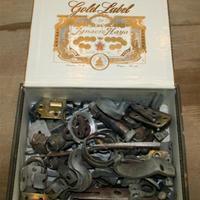 Cigar box with clamps and other similar metal objects. 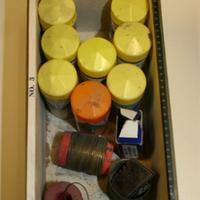 Bolts, nuts, hinges, springs and fasteners. 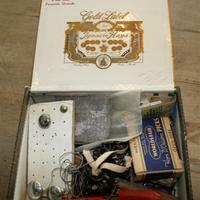 Gold label Ignacio Haya cigar box with items. 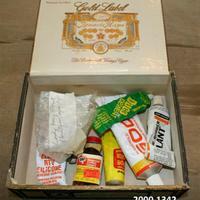 Gold label Ignacio Haya cigar box with used or partially tubes of glue, rubber cement, and silicon. 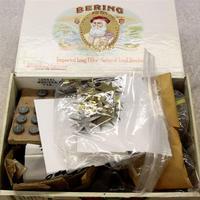 Eight objects in this box.